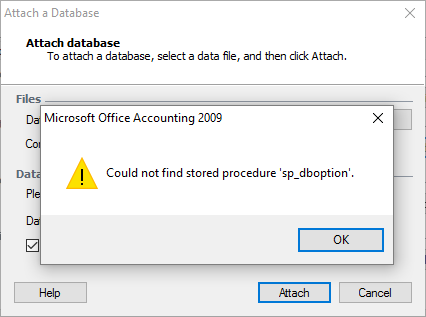 Could not find stored procedure sp_dboption. Applies to: SQL Server 2014. This stored procedure is not supported since SQL Server 2012. Attaching a database via Microsoft Office Accounting 2009 software is possible only with SQL Server 2005, SQL Server 2008 and SQL Server 2008 R2. You can manually attach the database to SQL Server using SQL Server Management Studio Express as explained here. SQL Server Management Studio Express can be downloaded for free from Microsoft Downloads web site. Alternatively you can restore a SQL Server backup of those databases on the upgraded SQL Server instance using SQL Server Management Studio as explained here. If you feel you don't have enough experience with SQL Server to try above workarounds, you can install OAP 2009 with SQL Server 2005, and then upgrade to SQL Server 2008 or SQL Server 2008 R2. Although all of them are not supported by Windows 10, you can choose to stay with the version that works fine with OAP 2009 in your computer.